Willow Springs is a racing venue in United States with 250 laptimes.This page represents the 3.9 kilometer (2.4 mile) configuration of this track. 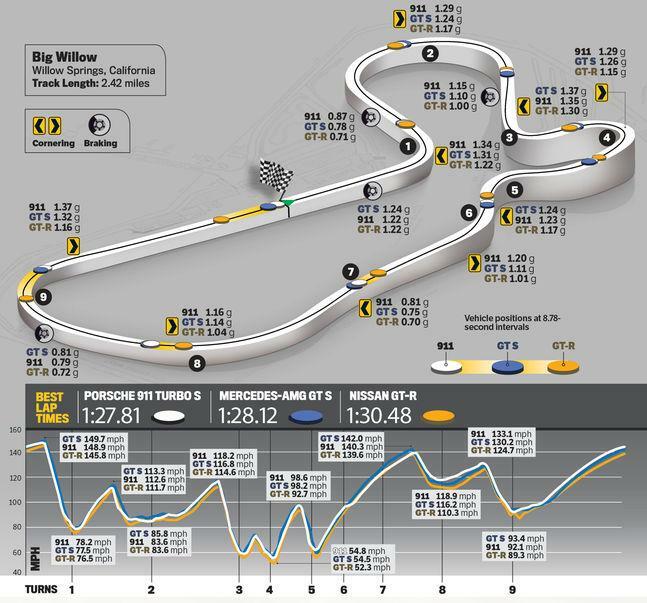 Willow Springs is a moderately fast track, with overall average speed of 147 kph (92 mph). Does anyone know what tyres the GT2 RS used for this lap? What happened to c7 ZR1, with new Motor Trend on demand , not able to keep up with latest episodes, I thought c7ZR1 would d at least do sub 1:22s, but its slower !! Hey, where's the modified, 600HP Toyota C-HR, positioned 6th with a laptime of 1:25.22 ? I love how a 115hp Formula Ford is still faster than almost every car on this list and costs tens of thousands less haha. It wont happen, But i think al 6 Series Bmws should have V10s. Alpina B6 and BMW M6 (Gran Coupe) both just ran on Willow Springs. Looks like the youtube link didn't work. Go to the article and then to video #4 for the Aprilia- then to 3:25 for the lap times. I don't know why they buried the data like that. Several motorcycle lap times for Willow Springs big track. I don't know why they put the lap times on the video, but not in the article for some of the bikes. 3:25 in the video for the lap times.